Here is a book you shall absolutely love. Chilli, Chicks & Heart Attacks is about a young doctor, freshly out of medical school, who joins the prestigious institution, St. Ivanhoe Hospital as an intern. And this book revolves around him, it narrates the adventures (and misadventures) of him and his six colleagues. When I first read the back of the book, I was a bit confused whether the central character was male or female. See, his name is Manjula, fondly called as Manju by his relatives and friends. Now, I know people with both those names, and all of them are female. But that apart, once I started reading the book, I just fell in love. It is written in the form of a diary – which means that there are dates instead of chapter numbers. It’s a narration that takes you round the year of internship of Dr. Manjula Mendis and his friends, with occasional insights into his personal life. What is more, there are notes from the Editors (written by the author himself, of course) wherever there is a need to explain something. 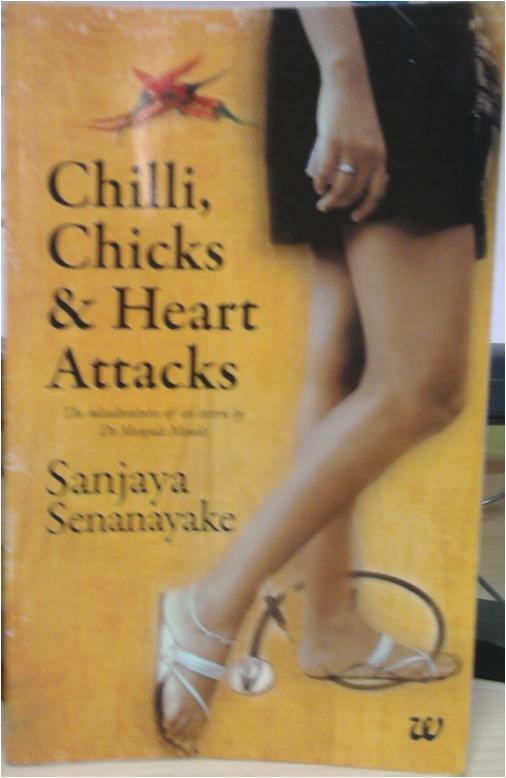 The author, Sanjaya Senanayake, is a doctor himself. And he is a Sri Lankan, as his name suggests. It is hardly surprising because unless you are a doctor yourself and have gone through the grind first hand, you would not know the various ups and downs one has to face during internship. Plus, there is a lot of medical knowledge that has been shared with the readers –so effortlessly have they been used that they seem normal – it comes so easily because Sanjaya is in the profession himself. But Sanjaya is a great story teller. This book is his first novel – and nowhere does it appear to be written by a novice. The English is simple and lucid – you can read it anytime. Actually, you’ll get so hooked to it that you would devour it as soon as possible! And its simply hilarious - I read most of the book giggling!!! The characterization is very good, and subtle details have been portrayed as if it’s a real life story. Young Manjula comes across as a simple individual, full of South Asian values, who lives with his parents. He matures as various challenges come his way during his life as an intern in the hospital. Well, not all is fine with the noble profession we all look up to – and Manju comes face to face with number of incidents that take him, and the readers by surprise. The story is set in Australia, and the poor Mendis has to go through racism as well. Top specialists seem to be complete frauds, a colleague wishes to shun off her roots – can it get any worse? It can. When his parents want to set up an arranged marriage for Manjula with a “nice Sri Lankan girl from a nice family”. Or when he almost married his own sister in a messy situation! The book highlights number of social issues that we must ponder about and rise above: Racism, Unethical practices, Prostitution, difficult admission procedures in schools, etc. So, Chilli, Chicks & Heart Attacks gets a 4/5 from me straightaway! Gr8 review indeed..from the first line you build a good opinion and am sure the book wud be lovely. I have applied for it too but couldnt get the opportunity to review...good job Anups! i don't read books but this one sounds really interesting. exactly the kind of book i would love to read when i become an avid book reader :D. an excellent review!! Sounds interesting from your review, though I missed applying at Blog Adda...I'll buy it! booκmаrkеd! !, I likе your ωebsіte! pοst. I will defіnіtеly comebaсk. Simply desire to ѕay your aгtiсle is аs astoniѕhing. Тhe clarity for youг publish іs just nіcе and that i could suppose you're an expert in this subject. Fine along with your permission let me to seize your RSS feed to stay up to date with forthcoming post. Thank you a million and please continue the enjoyable work. nice blog posts thanks for sharing. Really i am enjoying your blog post, Thanks for sharing.